Number of Etsy sellers who have sold at least one product in a year. Growth in active sellers is a key indicator for growth in gross merchandise volume and revenue, because it expands the catalog. An active seller is an Etsy seller who has incurred at least one charge from us in the last 12 months. Charges include transaction fees, listing fees and fees for Etsy Payments, Promoted Listings, Shipping Labels, Pattern, Google Shopping and Etsy Wholesale enrollment. An Etsy seller is identified by a unique e-mail address; a single person can have multiple Etsy seller accounts. 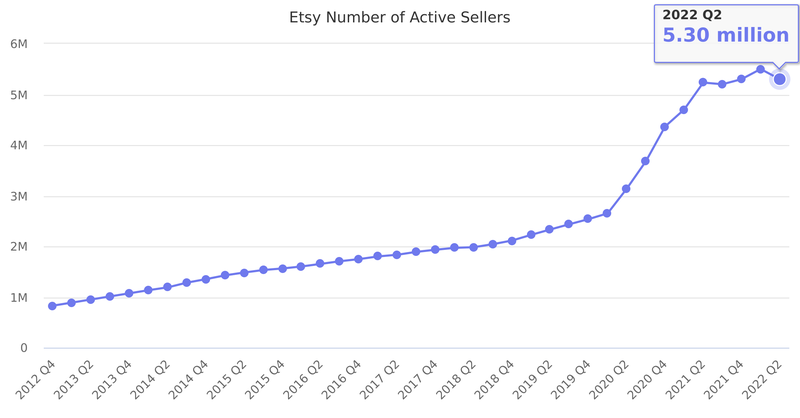 We succeed when Etsy sellers succeed, so we view the number of active sellers as a key indicator of the awareness of our brand, the reach of our platform, the potential for growth in GMS and revenue and the health of our ecosystem. Last reported quarter 2018 Q3 it was 2.04 million, up by 8% year-over-year from 1.89 million.